It is amusing the reactions I get when people find out where I took the Imago Dei Youth Ministry for our summer missional experience: Philadelphia, Pennsylvania. 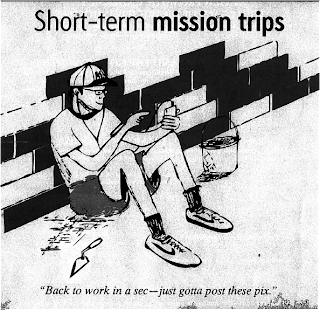 Youth Ministry over the years, at least within Suburban America, has developed the assumption that when students go on a “mission trip” they will embark on a highly fundraised adventure to an international destination, preferably a developing nation. These trips are likely to include expeditions to places of poverty and misfortune that not only make for great stories about types of food consumed, difficult living conditions endured, and language barriers crossed, but also for a sense of accomplishment as we share Jesus through programs like VBS, street evangelism, and work projects that more often than not could be completed better and more efficiently by the locals in the community. This is not to say that these projects are completely void of any and all significance, it is just to suggest that there may be other alternatives that allow us to be faithful not only to our identity as a universal people of God, but also sensitive to and aware of God’s activity in particular places that precedes our travels to these places. Even more, the Spirit of Jesus is often alive and well in places we frequently pass (drive) by, a la the priest and Levite in the story of the Good Samaritan (Luke 10:25ff), if we only would have the eyes to see and the ears to hear. Short-term trips (STMs) are contemporary versions of an ancient practice called pilgrimage (Perhaps we should call them STPs.) A pilgrim goes on a journey to meet God in a faraway place, hoping to return as a different person from the one who left…Pilgrims had no illusions that they were going to “change the world” by their pilgrimage, but they hoped that being exposed to the world, and to the stories of the saints who had been faith in it, would change them. They were much more than tourists, traveling simply for the fun of it (though medieval pilgrimages were often, appropriately, convivial and joyful affairs.) Pilgrims travel for transformation, and that’s a good thing (“Making the Most of Ministry Trips.” Youth Worker Journal. Sept./Oct. 2009. pp. 22-25). As we spent the week with our friends at Broad Street Ministry (http://www.broadstreetministry.org/), a partnership we have developed over the last three years with an urban faith community in Center City, we began to realize that we were on a modern-day pilgrimage. We may have only traveled 45 minutes, yet our eyes and ears were exposed to a world so different than our own and stories of prophetic saints who were practicing resurrection in ways that left us breathless and filled with hope. It is incredible to view the city, not as a tourist, rather as a faithful sojourner alongside those who live and serve, pray and celebrate, weep and grieve, feast and invite, worship and engage alongside the rich, poor, unemployed, overemployed, addicted, afflicted, homeless, artistic, believers, and doubters. It is true, Broad Street was a place, and is a place, where biblical stories come alive- and we were invited to be real-life characters in their dramatic improvisation that continues to bear witness to God’s dreams that are for the whole world—and we could not help but be transformed. I will never forget hearing from a student about how she had been to Rittenhouse Square annually with family, yet never once saw the homeless who frequently called this place “home.” She would never experience this place the same again. She was transformed by her pilgrimage. I continue to visualize the sheer joy that exploded from the face and vocal tone of one of the homeless men who toured us through the murals of Philly, one of which they helped to create. 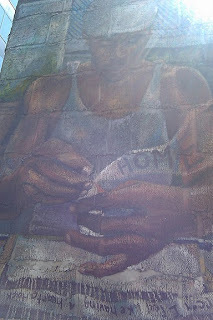 Sweat bursting from one of the men’s forehead and dripping from his hair, he told us of how the homeless wrote stories on pieces of fabric that were then woven onto this mural of hope for a home. The fabric was then painted over and plastered to the building, resurrecting their stories of struggle into a fresh and beautiful display of art. We would never view these murals the same again. And our small group was transformed. Then there were the trips to food banks, thrift stores that benefit victims of AIDS, urban gardens, St. Francis Inn in Kensington, tutoring at local elementary schools, New Jerusalem rehabilitation center, the list goes on and on. Ben Harper is right when he sings, “what good is a cynic with no greater plan” (Better Way). It is easy to critique the social injustices and the infinite realizations of a world in distress. Yet, we must not remain there…we must move as God’s people in the world who have the eyes to see, the ears to hear, and the legs that move in rhythm with God’s greater plan of redemption that met us full force this past week. And we did not have to travel very far. And Imago Dei Youth were transformed. Luke 19:41 says, “As [Jesus] came near and saw the city, he wept over it, saying, ‘If you, even you, had only recognized on this day the things that make for peace. But now they are hidden from your eyes.” Thank you Broad Street Ministry for removing the scales from our eyes each day, and even in the days to come, and revealing to us the One who has made for peace and the ways in which God’s people participate in it each and every day, even after we have left. May we now practice that same peace in our own communities as I AM sends us home. May God bless all of you as you have blessed us at Broad Street Ministry. Thank you for your words Greg but mostly for your love and passion for God's kingdom.